Some groups of commands may have more commands that they are showing in the Ribbon. For example, PAGE LAYOUT tab’s Page Setup group of commands has more commands than it is showing in the ribbon. How did we understand this? As there is a small arrow located in the lower-right corner of the Page Setup group. Click on this small arrow and the dialog box will appear on the screen with more commands. Like dialog box for a group of commands, a command may also pop-up a dialog box with more options when the command is clicked. These types of commands can’t work until you provide further information throughout the dialog box. For example, if you choose Review➪Changes➪Protect Workbook. 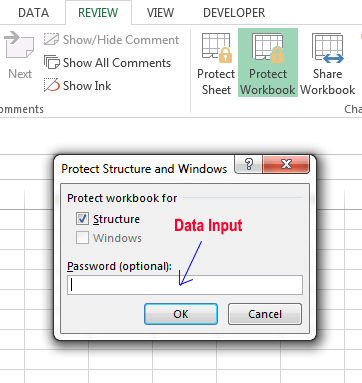 Excel can’t carry out the command until you provide the password in the ‘Protect Structure and Windows’ dialog box. Excel dialog boxes are of two types. One is the Typical dialog box, and other is the modeless dialog box. Typical dialog box: When a modal dialog box is displayed in the screen, you can’t do anything in the worksheet until you dismiss the dialog box. Clicking OK will perform your job and clicking Cancel (or press Esc) will close the dialog boxes without taking any action. Most Excel dialog boxes are of this type. Mode-less dialog box: When a mode-less dialog box is displayed, you can continue your work in Excel, and the dialog box remains open. Changes made in a modeless dialog box take effect immediately. An example of a modeless dialog box is the Find and Replace dialog box. You can get these two controls with the following command: Home⇒Editing⇒Find & Select⇒Find or Home⇒Editing⇒Find & Select⇒Replace. A modeless dialog box has no OK button, it has a Close button. If you’ve used other programs, you’re used to with dialog boxes. You can manipulate the commands of dialog box either with your mouse or directly from your keyboard. Navigating dialog boxes is very easy — just click the commands you want to use. Although dialog boxes were designed for mouse users, you can also use the keyboard. Every dialog box button has also a text name on the button. For example, if you click the dialog box launcher of the Font group of commands of Home tab, Format Cells dialog box will be displayed. 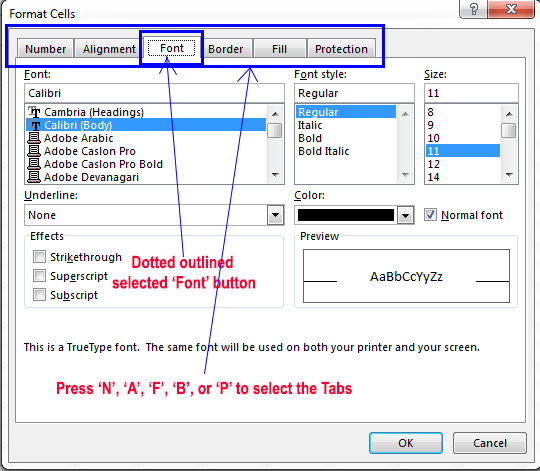 Format cells dialog box has Number, Alignment, Font, Border, Fill, Protection-these six tabs. If you press ‘P’ then the Protection tab will be activated. If you press ‘F’, the first text starting with ‘F’ will be selected (here the first one is ‘Font’). These letters (N, A, F, B, F, P) are called hotkeys or accelerator keys. You can also press ‘Tab’ from your keyboard to cycle through all the buttons on a dialog box. Pressing Shift+Tab cycles through the buttons in reverse order. Tips: When a button of a dialog box is selected, the button appears with a dotted outline. You can use the space bar from your keyboard to activate a selected button. Several Excel dialog boxes are tabbed dialog boxes. In our previous example Format cells is also a tabbed dialog box. Format Cells dialog box has six tabs: Number, Alignment, Font, Border, Fill, Protection. When you select a tab, a panel with relevant commands become visible. In this way, this Format Cells dialog box is basically a packet of six dialog boxes. Tabbed dialog boxes are highly convenient because you can make several changes in a single dialog box. After you have made all your setting changes, click OK or press Enter to quit the dialog box. Tips: If you want to select a tab of a displayed dialog box by using the keyboard, press Ctrl + PgUp or Ctrl + PgDn, or simply press the first letter of the tab that you want to activate.